It's Day Two of the Dozen Days of Giveaways. And today's prize is Pure Natural Mineral Makeup... sponsored by Overall Beauty Minerals! It's a $60 value! I love their rich, deep, heavy pigmented eye shadows. Overall Beauty is Vegan! They offer only carmine-free eye shadows without bee’s wax. Overall Beauty Minerals is animal cruelty free. They do not test on animals, nor do they believe in testing on animals. Overall Beauty Minerals is gluten-free. Meaning it is free of Wheat, Oat, Rye and/or Barley derived ingredients. If you are the lucky winner you will have the option to pick your own shades if you would like different colors. 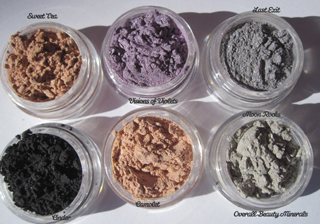 You can see all the gorgeous shades at http://overallbeauty.com/shop/ or http://kmms.etsy.com. This giveaway begins on January 29, 2014 and will end at midnight, February 6, 2014. The giveaway is open to international entries and you must be 18 years or older to enter (or have parental consent). Enter via the Rafflecopter Widget below. Don't forget to enter Day One - the China Glaze Giveaway!